Do not substitute hulled barley or hull-less barley in this recipe. 1. Bring 4 quarts water to boil in Dutch oven. Add barley and 1 tablespoon salt, return to boil, and cook until tender, 20 to 40 minutes. Drain barley, spread onto rimmed baking sheet, and let cool completely, about 15 minutes. 2. Whisk oil, molasses, cinnamon, cumin, and ½ teaspoon salt together in large bowl. Add barley, raisins, cilantro, and pistachios and gently toss to combine. Season with salt and pepper to taste. 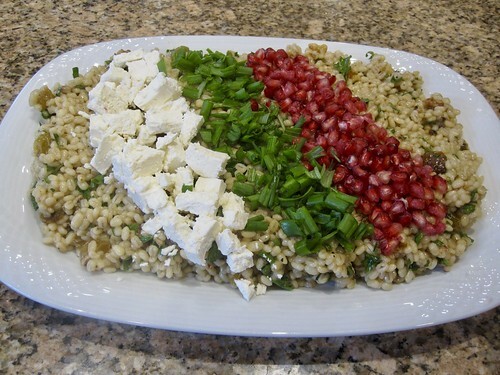 Spread barley salad evenly on serving platter and arrange feta, scallions, and pomegranate seeds in separate diagonal rows on top. Drizzle with extra oil and serve.